1. Parisotto MT, et al: Cannulation technique influences arteriovenous fistula and graft survival. Kidney Int 86: 790-797, 2014. 2. Krönung G. Plastic deformation of Cimino fistula by repeated puncture. Dial Transplant 13:635-638, 1984. 3. Woodson RD, Shapiro RS. Antegrade vs. retrogade cannulation for percutaneous hemodialysis. Dial Transplant 3:29-30, 1974. 4. Ozmen S, et al. 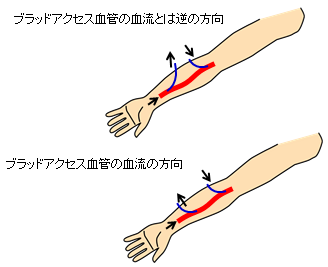 Does the direction of arterial needle in AV fistula cannulation affect dialysis adequacy. Clin Nephrol 70:229-232, 2008.